Boasting maximum power with minimum impact, Fuji EnviroMAX Super Alkaline Batteries provide the best of both worlds at no added cost. In addition to furnishing unsurpassed power and longevity, these batteries meet a world standard for eco-friendly, recyclable materials. It's a high-quality battery - in fact, one of the best technology has to offer. It has a 10-year shelf life, which is one of the longest shelf lives available in the industry. It also has a superb discharge curve, and strong leak tightness. Furthermore, it can handle wide temperature characteristics and is able to perform in extreme weather conditions. 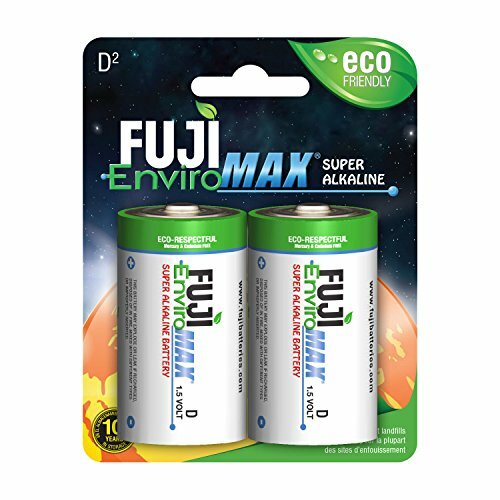 All batteries may look the same, but Fuji EnviroMAX has been dedicated to developing one of the most environmentally-respectful batteries on the planet for 20 years. Made in some of the world's most eco-respectful battery plants that operate under some of the strictest standards of environmental responsibility, the materials are derived from the basic elements of the Earth. These 1.5-volt batteries contain no mercury or cadmium - heavy metals that are harmful to the ecosystem. There is nothing inside an EnviroMAX battery that will harm the ecosystem if it is disposed of through normal waste systems. What's more, they're even labeled and packaged with recycled paper and P.E.T. plastic. Independent tests show Fuji batteries meet or exceed the competition in every category. Great for many portable electronic devices that we have come to rely on, this Super Alkaline Battery maintains strength throughout its entire life. Best of all, it's 100% recyclable and comes in a wide variety of blister packs and multi-packs to fulfill every need. HIGH-QUALITY BATTERIES. Tested by independent labs, the Fuji EnviroMAX battery boasts one of the longest shelf lives in the industry. These independent tests show that Fuji EnviroMAX batteries equal - and most often exceed - the performance and longevity of equivalent major brands. COMPETITIVELY PRICED. You truly get the best of both worlds with Fuji EnviroMAX - at no additional cost. Not only do you get to enjoy unsurpassed power and longevity, you also get to revel in the fact that these batteries meet a world standard for environmental responsibility and recyclable materials. CHOICE OF SIZE. Fuji Batteries come in a wide variety of blister packs and multi-packs to fit everyone's needs. Great for cameras, audio devices, games, remote controls, headphones, flashlights and much more, all batteries are made under some of the strictest standards of environmental responsibility and are 100% recyclable. If you have any questions about this product by Fuji EnviroMAX, contact us by completing and submitting the form below. If you are looking for a specif part number, please include it with your message.